Pescadero is a small rural village located at about Km. 64 on Mexico 19, only 8 Km. south of Todos Santos in Baja California Sur, Mexico. Pescadero is about a 45 minute drive north of Cabo San Lucas. It has a pleasant climate and has been undergoing some changes in the last few years. 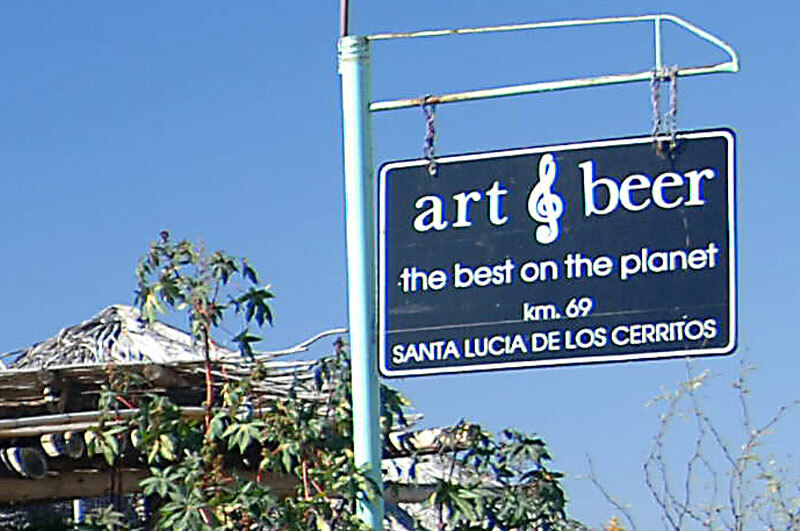 Art & Beer - This cluster of palapas found on our way to Todos Santos, on Mexico 19 at Km 69, a few miles south of Pescadero. Run by Lourdes Campos and her partner Alfredo Ruiz, the simply named Art & Beer is known for its “chocolate clams”marinated in 17 ingredients and served raw in their Hershey-brown shells. Baja Life Camp - created in the sunshine of Southern Baja - in between surf sessions - inspired by the abundance of fresh organic food in the area and a beautiful beachfront retreat. 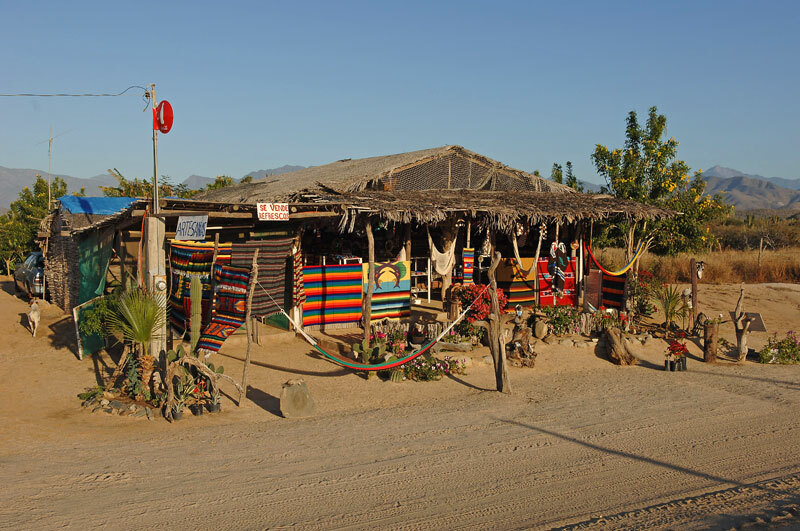 Baja Life Camp Headquarters, Barrio Las Palmitas, km 64, Hwy 19, El Pescadero. 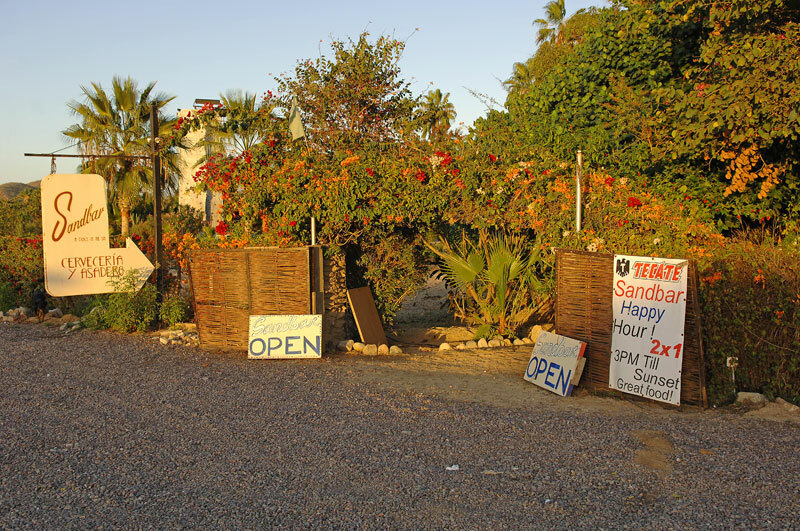 Baja Serena RV Park - Mayra and Dr. Hector Flores invite you to stay with them at Baja Serena RV Park, located right next to their grocery store, MiniSuper Los Arcos, on Highway 19 in El Pescadero. Beachfront Family Hacienda - The perfect family retreat can be found right here, on the beach in Pescadero, BCS, CP 23305 Mexico. Cerritos Beach Club - A new restaurant on the beach, just opening the end of January 2007, Cerritos Beach Club serves breakfast, lunch and dinner on the beach at Playa Los Cerritos. El Pozo Hondo Bed and Breakfast - This restful two-bungalow bed and breakfast is located in Pescadero, a short drive from Todos Santos. 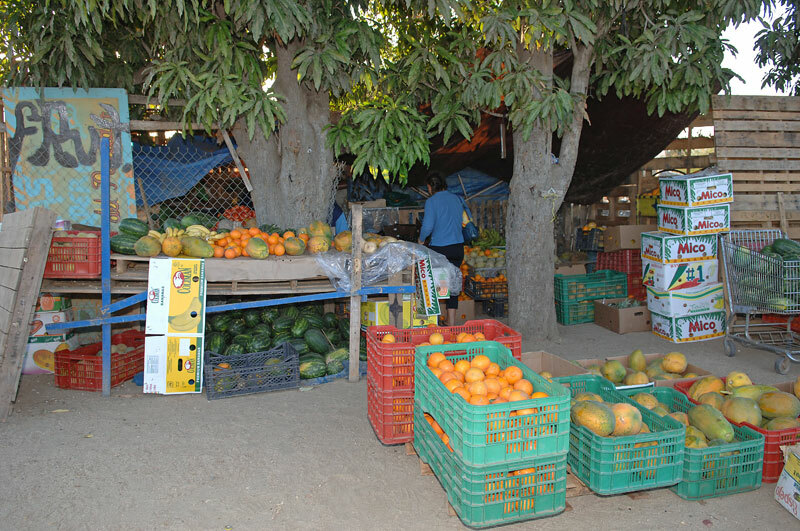 Fruit Stand - Fresh fruit and vegetables along the road in Pescadero operated by Evaristo Villalobos Albanez. Los Cerritos Beach - A beautiful, sweeping expanse of pristine beach just south of the farming community of Pescadero. Las Palmas Tropicales - Beachfront Rental Casitas - Four casitas overlooking the famous San Pedrito Beach and Surf Break. All rooms are non-smoking with beautiful views. Pescadero, BCS. Milagro Real Estate - Office now open in Pescadero. Oldest established realtor in Todos Santos. Dale Townsend (Broker and Owner) is Canadian and Mexican. Open Monday to Saturday 9 am to 5 pm. Pescadero Properties - We list a few special properties, from time to time, but in the fluid world that is México, there are more possibilities than are first seen. Our address is: Empresa del Pescadero S.A. de C.V., Roc Vincent Fleishman, Pescadero Properties, Juarez, s/n, entre Zaragoza y Morelos, Colonia Centro, Todos Santos, CP 23305 BCS México. Pescadero Surf Camp - Located in Pescadero between Playa Los Cerritos and Playa San Pedrito, at Km. 64 on Mexico Hwy 19, one hour north of Cabo San Lucas. Individual and group surfaris, instruction, rentals, supplies, accommodations and swell reports. Playa San Pedro (Las Palmas Beach) - Playa Las Palmas is a smaller quarter mile expanse of beach bordered by a reed lagoon and protected by rock promontories on both sides. Groves of palm trees frame this gorgeous small beach. We are a different kind of Dude Ranch - an outrageous oceanfront oasis situated on 15 beautiful acres in Baja California Sur, that has a spanking new approach to what a luxury boutique hotel experience can be. 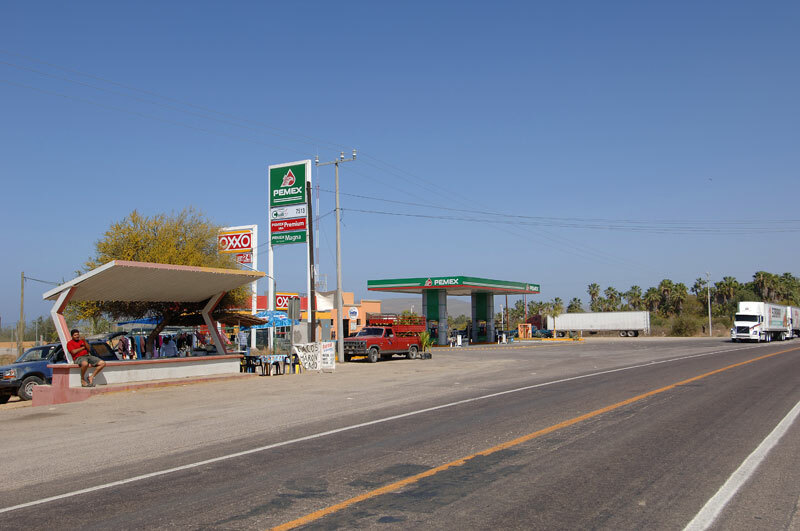 At Km 62 along Mexico 19, (highway to Todos Santos) turn west at Pemex Gas station in Pescadero, travel one mile to Rancho. San Pedrito Beach - Formerly called Playa El Estero, this popular surfing beach is called El Pescadero after the fishing village nearby. The San Pedrito RV Park was all but distroyed by Hurricane Ignacio in August 2003. The RV park is closed, but access is still available. There are some campers there, but no services. San Pedrito Surf Hotel - Newly renovated inside and out with a fresh new look and inviting king sized beds. We are centrally located just 40 minutes north of Cabo San Lucas, and 15 minutes from the charming Todos Santos artist community. Our rooms come with bottled water, basic cooking utensils and spices, safes, fire extinguishers, towels and bed linens and there is a washer/dryer on the property. Rates: $65 to $150 per night, plus 13% room tax. Sierra de la Costa - Beach Bungalow Rentals - The accommodations at Sierra de la Costa include our Casitas, Casa de Sol and Casa de Estrella are fully furnished and decorated. Each casita has its own private porch and BBQ/burner for our convenience. Pescadero, Baja California Sur, Mexico.